However, the same code used to produce vector output before I reinstalled the operating system. I am not sure which version of MiKTeX I had before, and the current version is Portable MiKTeX 2.9.6620. I have already tried to install cm-super package (upon an advice that I found on the internet), but that did not solve the problem. Is there a way to restore the previous behavior? Note: I would prefer to keep the same code (or, at the very least, to make only small changes to it), that is, if there is a solution that includes writing Cyrillic script in some another way, that does not suit me. This is exactly the output I want to have. 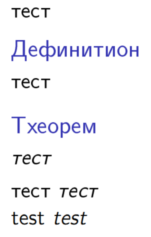 However, the problem is that the letters are rasterized (actually, the Cyrillic letters; the Latin ones are OK). Therefore, the question is what I should do in order to get the same output but with vector letters. Exactly the same code was working perfectly on my previous operating system; therefore, I hope that there is an easy fix for this problem. I doubt that your code ever worked correctly. Imho beamer always used \sfdefault as \familydefault, and so your redefinition of \rmdefault would never do anything in beamer. Not the answer you're looking for? Browse other questions tagged fonts font-encodings cyrillic installing-fonts or ask your own question. How to pass definitions to \AtBeginDocument?